Rotor Sets - A. S. Thomas, Inc.
NUFORM Level-II was utilized to effectively Program the machining of the displayed 50mm rotor set (male and female) on a Boston Digital 5-Axis Machining Center. Each rotor was machined to better than a 32 micro-inch finish in one set-up. Compressor efficiency improved 15%. Manufacturing cycle and costs were significantly reduced. The material is 4140 steel, 40 Rc. The total cycle time for the pair of rotors is 6 hours with total consumable tooling cost under $50.00 per set. 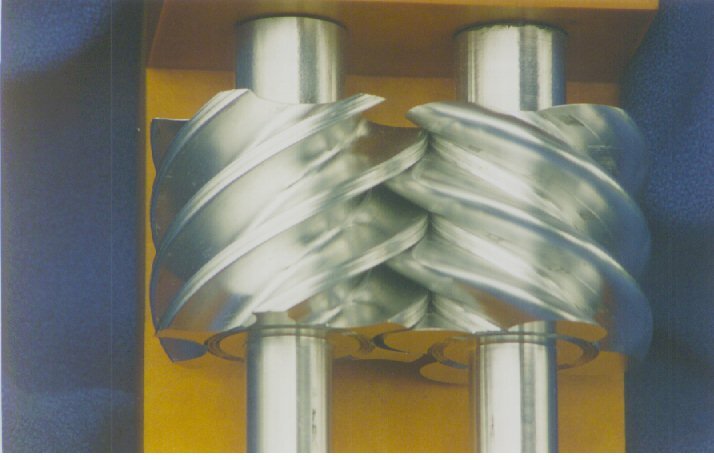 A. S. Thomas, Inc. can provide a complete turnkey for the efficient production of rotor sets as well as other products.